Over the years, Exeter City Football Club Supporters Trust have been engaged in a number of projects geared at collecting and preserving the history of Exeter City Football Club. In some cases these were developed with the support of Exeter City Football in the Community. The first project was Grecian Voices which was set up and led by Andy Fuller fro the Trust in 2008-9 with the support of the Heritage Lottery Fund with the aim of recording people's memories of players and fans - you can read up about it in Grecian Voices or watch the short film documenting the project at Grecian Voices. This led to the creation, in co-operation with 1010 Media and the University of Exeter, of a website with the same name Grecian Voices in 2013-4 which also hosts a blog that records the research and development for Placeify, a trail making tool developed by 1010 Media with Exeter City Football Club Supporters Trust, Royal Albert Memorial Museum and Art Gallery and the University of Exeter. This project led to the development of two trails: 'Exeter City Football Club', written for the general public, and 'St James Park', written for the children taking part in the Kick Start programme which were used by Will Barrett with Gabriella Giannachi in a number of sessions in 2013-15. At the time of the centenary of the match against Brazil, in 2014, an exhibition was curated by Kiera Gould with funding from the Heritage Lottery Have You Ever Played Brazil: Online Exhibition and a book with the same title was published by Aidan Hamilton which can be purchased from the Club's shop. 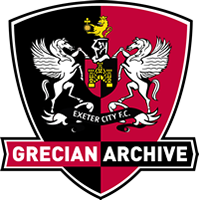 The Grecian Archive aims to facilitate the exploration of the history and heritage of Exeter City Football Club. In 2018 further funding from the HLF contrbuted to the development of the ECFC Musuem, which provides a stadium wide approach to heritage at St James Park. To support this project, Gary Stringer, Richard Holding and the team from the University of Exeter Digital Humanities Lab worked with us to create a new look Grecian Archive with streamlined navigation and added functionality. Every effort has been made to trace copyright holders and to obtain their permission for the use of materials in the archive. The publisher apologises for any errors or omissions and would be grateful if notified of any corrections that should be incorporated in the archive. You are welcome to contact us if you wish to contribute to this archive. You can also comment on any item of the archive through our social media pages on Facebook and Twitter. William Barrett (Doctoral Student in Digital Heritage) and Gabriella Giannachi (Professor in Performance and New Media) at the University of Exeter, UK.